Spent today at the Southampton Boat Show with some friends. 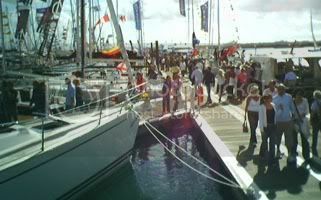 It's an absolutely massive event with every kind of vendor there is that has something to do with boats showing off their wares. The best part is going onboard all the different kinds of yachts and checking them out. Sunseeker had a massive stand so I climbed aboard one of their baby luxuy powerboats since it had almost no line-up. It was a Predator 55 and sold for a cool £576,000. Yep, it was nice for the bottom of the range. Very comfy. Even had a small garage for a speedboat. The top of the range is around £5,000,000! I stuck mostly to checking out 40' sailboats. It's the size I like. Not too big; not too small. Of the ones I looked at, my favourites were the Elan Impression 384 and 434 distributed by Moody. Excellent layout, comfortable, light and airy. No idea about how they perform. Base price of the 384 is £103,000. Reasonable compared to the cost of similiar size yachts. No, I'm not about to buy a yacht but it's fun to think about it. If I was seriously going to try to do a lot of sailing, I would rather buy into a syndicate of some kind and share the expense with others. I think you found the best boats at the show. We did a lot of research into various boats of the size you mention and eventually bit the bullet and bought a 434 which arrived here in Singapore last week. You can follow our fun at the enclosed blog address. Hope you find your boat one day.